LANSING — A nonprofit organization connected to Gov. Rick Snyder had a big-spending year in 2016, according to a recently released tax filing. Making Government Accountable paid out $1.7 million in the election year, more than other Snyder-linked nonprofits reported spending in past years since he became the top state officeholder in 2011. Much of the money came from dollars Making Government Accountable raised the year before in 2015. The organization raised $2.2 million in 2015, its first year of existence.In 2016, it raised only $570,00, but it started the year with about $1.7 million available. As a social welfare organization, Making Government Accountable doesn’t have to disclose the names of its donors. But it has to release an annual filing that shares information on how much money it raised and how much it spent. The organization launched as Snyder considered a run for president, a run that didn’t take shape. In 2016, the organization focused its spending on a program aimed at spreading the “Michigan comeback story,” says its tax filing, which is dated October 2017. Issue ads are advertisements that don’t expressly tell viewers how to vote in an election but talk about issues and often, candidates who will be on the ballot. Issue ads are a way some organizations spread positive or negative messages about candidates through advertisements without falling under campaign finance disclosure requirements. The Michigan Campaign Finance Network tracked at least $315,000 in TV ads from Making Government Accountable in 2016. Many of the ads ran in the fall of 2016, and some highlighted Snyder-backed state House candidates who were on the ballot in November 2016. Making Government Accountable doesn’t have to disclose specific information about its expenditures. But the organization reported spending $622,218 on the broad category of “public relations/communications” in 2016. In addition, it reported giving $250,000 to the The Governor’s Club, an account that supports Snyder’s administration by previously paying for things like consulting fees and travel expenses. Making Government Accountable also gave $325,000 to Moving Michigan Forward, another Snyder-connected nonprofit (not to be confused with state political action committees named Moving Michigan Forward, which aren't connected to Snyder). The Governor’s Club and Moving Michigan Forward disclose their donors, but the original source of the money Making Government Accountable transferred to them isn’t available. Both Making Government Accountable and Moving Michigan Forward are social welfare organizations that fall under Section 501(c)(4) of the Internal Revenue Code. These types of organizations aren’t supposed to focus their primary efforts on partisan political activities. After taking office in 2011, Snyder raised money through another social welfare organization, the New Energy to Reinvent and Diversify Fund, also known as the NERD Fund, which didn’t disclose its donors. The NERD Fund’s biggest spending year was 2011 when it reported $865,830 in expenses. It raised $1.3 million that same year. From 2011 to 2014, the NERD Fund spent a total of $2.1 million on a variety of initiatives, including public policy research, paying a member of Snyder’s team and other activities that could have fallen to taxpayers if not for the organization. After public outcry against the secrecy of the NERD Fund’s donors, Snyder shut it down in 2014. That same year, he launched Moving Michigan Forward, which began disclosing its donors on a website. "Making Government Accountable (MGA) reports all of it’s activity in accordance with state and federal law,” a statement from the organization said this month. “MGA focuses its resources to promote the Michigan Comeback." 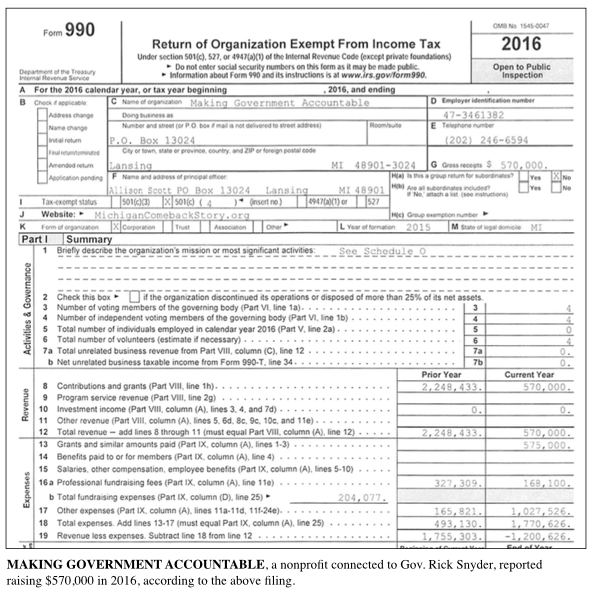 Making Government Accountable’s tax filing lists three directors, including William Parfet, a businessman who has been a major Snyder donor — his fourth largest disclosed supporter according MCFN's tracking. Parfet was co-finance chair of Snyder’s 2010 campaign for governor. As Snyder prepared for his final year in office last fall, the organization continued to raise money. According to the Detroit Free Press, it held a fundraiser in Detroit in November 2017. As of the end of 2016, Making Government Accountable reported having $554,677 still available to spend.